As you know I have been a proponent of giving the Salvation Army and other non-profit organizations a break in dealing with the garbage that is generated as part of their community services. This posting looks to the people of Parry Sound to do the right thing themselves. Yes it’s what you think it is. 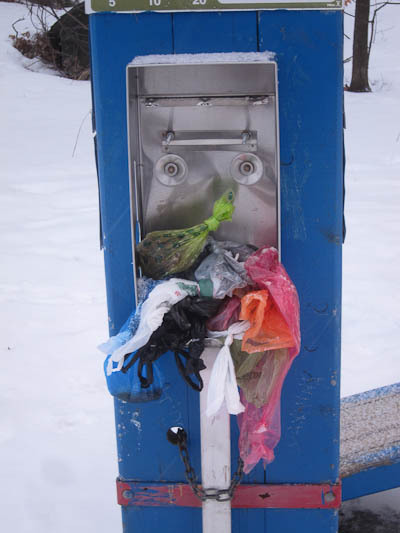 While people are good enough to pick it up, it would be appreciated if they would carry it out with them. 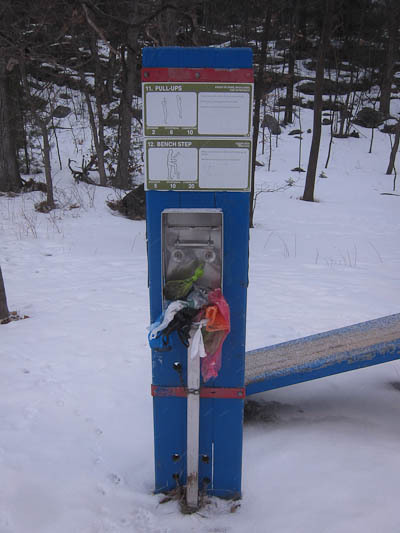 I know there are no garbage cans along the fitness trail once the snow flies, but it really isn’t too much trouble to carry it in the hand not holding the leash. If your dog was able to carry it to the trail, you should be able to carry it out. This is not a problem unique to Parry Sound. A trail close to where I lived in Austin was regularly dotted with these packages. In that case I wonder if it wouldn’t have been better to leave it where it landed and not bag it. It would have returned to nature in short order. It’s a different issue here, where the snow provides a delightful contrast. But please let’s pick it up and take it home. It all ends up in the same place.